Estill County Emergency Medical Services recently put a new ambulance on the road which increases the fleet to six with five of them licensed and in use. Director Ron Jackson was happy to show it off last week and explain all about it. Jackson said he borrowed the balance and will have it paid off in three years. “That is about the time we will need to buy another ambulance,” he said. 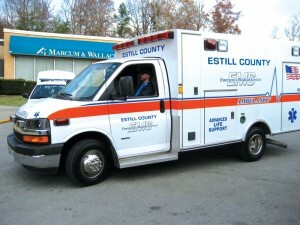 All Estill ambulances are serviced regularly by Herbie Rogers. The oldest ambulance has 267,000 miles on it and Jackson said they average racking up 40,000 to 50,000 miles a year. Jackson also praised the people who staff the amublances as well as the mechanic who takes care of them. “We have a lot of caring people working for us,” he said.